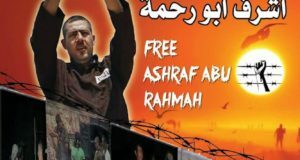 Home / Press Releases / Israel’s Wall puts Emad Burnat of Bil’in and his children in hospital. Israel’s Wall puts Emad Burnat of Bil’in and his children in hospital. At 5:20 pm on Saturday 22nd November, Bi’lin Popular Committee Against the Wall and Settlements member, Emad Burnat, was admitted to hospital in very serious condition after his tractor flipped over against Israel’s Apartheid Wall. The wall – which in Bil’in is composed of metal fence and barbwire – cuts through the village’s farmland. 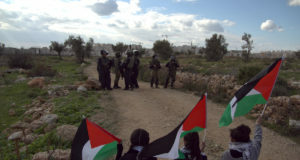 The video documenter of the Bi’lin’s anti-wall struggle was returning with his children from plowing his fields when he was forced to detour down a steep hill in order to return to the village because the wall separates his home from his land. Loosing control of the tractor on the sharp decline, it overturned directly into the metal mesh and razor wire. While his children were taken to hospital in Ramallah, the army medic who treated Burnat decided to send him to the Tel Aviv hospital out of fear that he wouldn’t make to Ramallah alive. None-the-less, it still took the ambulance an hour to arrive at the checkpoint and Burnat had to be transferred from a Red Crescent to an Israeli ambulance before being taken to Tel Aviv. 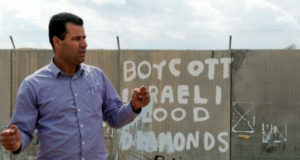 “While this is a tragic accident, the blame can be laid directly at the feet of Israel’s occupation and land confiscation by the wall, which forces a dangerous burden and risk on Palestinian farmers,” says popular committee chairperson and cousin of Emad, Eyad Burnat. “Israel’s checkpoint system only adds to this hardship by preventing the speedy medical attention to Palestinians when necessary,” he added. At present Burnat’s spleen has been removed and doctors have yet to stitch up his wounds because his liver is still bleeding. Doctors are exercising cautious optimism, reporting that he arrived at the hospital in time and was a healthy man. Burnat’s children were treated for mild injuries.